Hair plays a vital role in our appearance and in our life. It is much more complex than texture and color and in fact, hair can even transmit sensory information. Hair loss affects both women and men at any age. Loosing one’s hair can have a massive impact on a person’s self-confidence. However, today there are excellent hair replacement procedures that can change that completely. If you’re thinking about a hair replacement procedure, you may find it helpful to understand a little bit more about our hair growth cycle. Anagen is the active or “growing” phase of the cycle when the cells in the root of the hair divide at a rapid rate. Hair grows approximately 1cm a month and can stay in this active phase of growth from anywhere between two and seven years. People who feel like their hair does not grow past a certain length have a shorter anagen phase than other’s whose hair grows longer. The catagen stage is the transitional part of the cycle and only lasts for around two to three weeks. Approximately 3% of all hairs are in this stage at any given moment. In this stage hair growth stops and the outer root sheath shrinks and attaches to the root of the hair. This forms a “club hair”, which is basically a hair that has stopped growing and is no longer in the active stage. 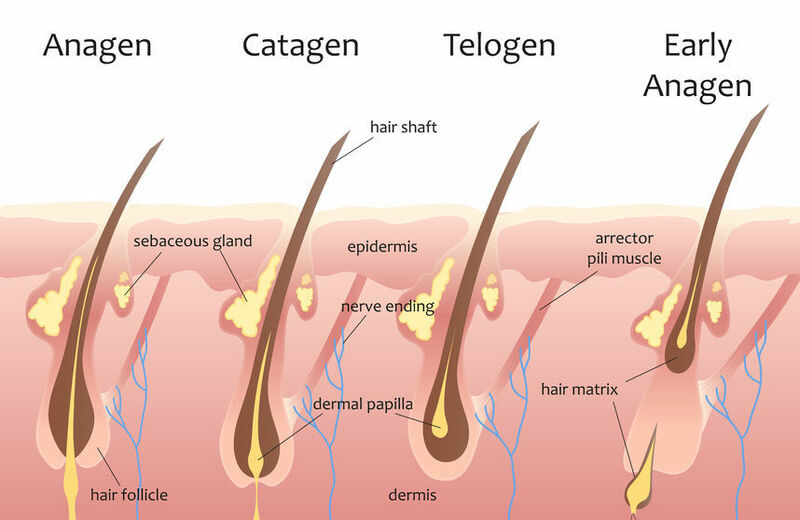 Telogen is the resting phase in the hair growth cycle when the hair follicle is completely inactive. Normally 6% to 8% of all hairs are in this stage, which tends to last about 100 days on the scalp. We shed on average between 25 to 100 hairs a day. Since other hair is also in the growth stage at the same time (about 100 anagen hairs grow everyday) this amount of shedding usually goes unnoticed. However, when the growth/shedding cycle is disrupted then hair loss becomes more obvious. It can also happen if a hair follicle is damaged and scar tissue grows in its place.